Officially Spring will not be sprung until 5:58 p.m. on Wednesday, March 20, but this past weekend temperatures inched into the 80s and more importantly the rain stopped. Don’t get me wrong, I’ve loved the rain, but enough already! If I liked rain that much I would have moved to Seattle. 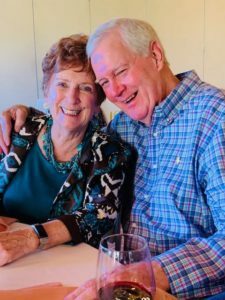 Linda and I took off for Santa Maria on Friday morning to attend the 80th birthday party of my sister-in-law, Sharon. Our first stop was at Dana’s bakery in Monrovia, for their famous blueberry pancakes and the best bacon ever. 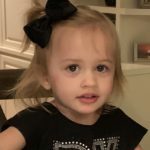 But the best part of breakfast was time with granddaughter, Addison, who never ceases to amaze us. 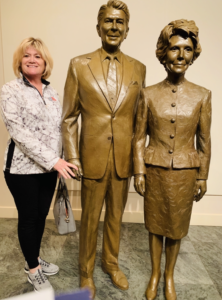 We took a detour on our way up through Simi Valley, were we visited the Ronald Reagan Presidential Library to see an exhibit on Pompeii; as we will be visiting Pompeii later this year on our cruise around Italy. The exhibit included lots of information about life in the Roman Empire in the year 79 A.D. and in particular on the date of August 24th when Mt. Vesuvius erupted in a most dramatic style and buried the entire city of Pompeii under millions of tons of volcanic ash. With no planes, trains or automobiles to quickly get out of town, over 2,000 people were killed and fossilized in various positions trying to get out of the city. While at the library, I took a picture of Linda with Ronnie and Nancy, who appeared a little stiff. Our cloudless sunny drive continued over to the coast to Santa Barbara and lunch on the water at the Blue Water Grill, just across PCH from Stearns Wharf where we enjoyed the sun and salt air as we strolled the pier after lunch. We continued our drive up the coast and then inland to Santa Maria for a pre-birthday dinner at Jack & Sharon’s house. We’re just trying to keep up! Bob we have an Addison also. Great grand baby. What a joy she is. Brittany her Mom is my Granddaughter front Cindy. Yesterday was Mavericks 2nd Birthday. He is all boy. Fullback type and also is spirt. Full speed ahead. Good to hear from you Gary – ain’t grandkids cool?! Stay well!! Thanks, again for making us feel like part of your family sharing trip stops ad birthday celebrations. I’m with Sharon….move it or lose it! You ARE part of the family Pam! Yes, we all need to keep moving. What a fun trip! Sharon’s party was certainly a highlight and I love her advice about staying active! Excited that you’ll be seeing Pompeii – I found it fascinating! We love having you and Linda in Santa Maria and I was very pleased to have you, along with all my (odd – haha!!) family and friends to help celebrate this birthday. It was a very special weekend. Great family gathering! I think we were the ‘odd’ ones.